Well…okay, you don’t really have to ditch it. However, It’s one item we recently removed from our kitchen and I’d love to encourage you to try it out too. One thing I love about a Kitchen is having clear counters that are free from any clutter. A little over a year ago we decided to remove our toaster, blender and paper towel holder from our counters. I wanted to simplify and streamline things so we found a place for these items in our cupboards instead of having them out on the counter all the time. We have not missed having them on our counters at all. In fact, we haven’t used our toaster since because we just use our double oven which has a toaster button. Lately I’ve been thinking about one item that I’ve been wanting to remove from our counter. That one item is our knife block. I have just found that anything you do have on your counters will collect dust. Since our knife block was so close to our stove, it would easily get grimy and dusty. So what we’ve decided to use is a knife organizer in our drawer so there’s no need to use the knife block anymore. And as a result, we’ve been able to donate the few knives that were never used from our knife block as well. It was great to be able to pare down and just keep the knives we use regularly for meal prep or certain things like our serrated bread knife. What do you think? Are you a fan of knife blocks? 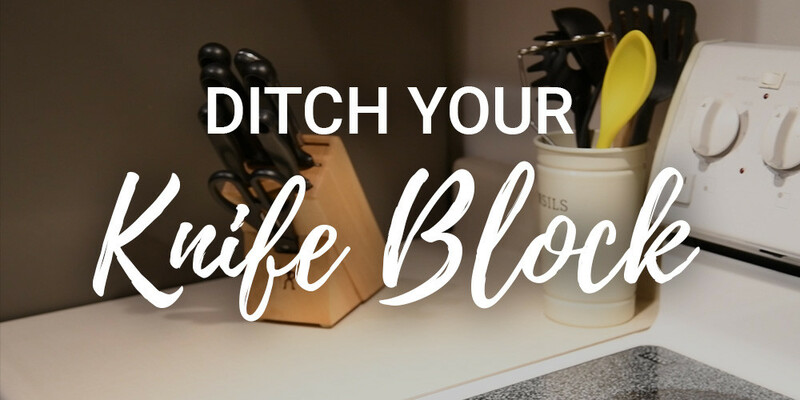 Let me know your thoughts on whether you think you’d be able to ditch your knife block too.